Seo chugaibh cúpla nasc d'áiseanna áisiúla. Seolfaidh na nascanna seo tú amach as suíomh na scoile. Tugann Webwise.ie nodanna úsáideacha duit ar chonas a bheith sábháilte ar an idirlíon. Below are some links to useful information. Please note these links will direct you away from the school's webpage and we accept no responsibility for the content of other websites not managed by us.. Webwise.ie provides useful tips for keeping safe on the internet. We hope that the following links prove useful. Tá seirbhís chabhrach nua ar fáil do thuismitheoirí maidir le obair bhaile na bpáistí. Bíonn múinteoir ar fáil 'beo' chun ceisteanna a fhreagairt idir 4-6 i.n. 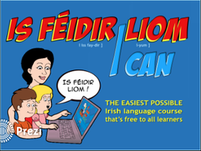 Luan go Déardaoin ag http://irishforparents.ie/cabhair-bheo-live-help/​. There is a new service now available for parents wanting to help with children's homework but struggling Irish. A teacher is available to answer questions relating to Irish homework between 4-6p.m. Monday to Thursday at irishforparents.ie/cabhair-bheo-live-help. Spelling City has activities based on the spellings in Jolly Grammar 1 - 6 for Rang 1 - Rang 6. The children can play games, learn their spellings and do practice spelling tests on this website. Please note, there is an option to become a “premium” member of this website but it is not necessary to join the website as there are plenty of free activities that the children can use. Online Irish dictionary, including sound files which pronounce Irish words.